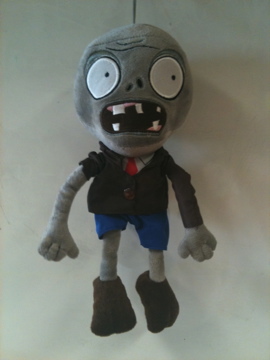 This morning’s visit to the departmental post boxes was unusually rewarding, as mine had a zombie in it. Well, to be accurate, it had a zombie in it again. It’s only a couple of weeks since I picked up my copy of Mathematical Modelling of Zombies (which is excellent, by the way). I was expecting that, as I’d ordered it, but this morning’s zombie delivery was a pleasant surprise, and it came printed on the front cover of May’s edition of the Institute of Physics monthly magazine, Physics World. The brain-munching monster in question was evidently trying to claw its way in (or possibly out) through some sort of frosted glass panel, while simultaneously advertising an article on ‘Zombie physics – When statistical analysis meets the undead’. All the usual suspects are there, including the Patient Zero of mathematical and academic zombie infection, Robert Smith?. This story focused on the work of Alex Alemi and Matt Bierbaum, a couple of Cornell University graduate students who decided to apply some specialised techniques of statistical modelling from (among other places) condensed matter physics to the spread of a zombie contagion. Obviously I was happy to see my favourite pop culture ghouls in the hallowed pages of Physics World, in addition to all the other odd places they popped up recently (‘Theories of International Politics and Zombies‘ and ‘Braaaiiinnnsss! : From Academics to Zombies‘ being a couple of my recent favourites). But it set me wondering – again – what it is about zombies that makes them simultaneously unlikely and perfect as topics of academic discussion, and in so many different fields? So it’s partly a matter of familiarity. The popularity of stories such World War Z and The Walking Dead means that the first impression given by an article with a title like “Zombie Physics” is likely to be something along the lines of “Zombies? I like zombies! So have these physicists made a real zombie then? Must find out…” A title like “Statistical mechanics applied to infectious disease transmission” on the other hand, has more of a niche appeal, mainly to those who already know what statistical mechanics is, why it might have applications to disease, and (perhaps most importantly) feel confident that they’ll be able to wade through an article with ‘statistics’ in the title without developing acute anxiety, hives, and three or four extra limbs in the process. This is where the real brains enter the story. A lot of people get a bit twitchy about maths and science, to say the least. The subject names themselves can induce fear. This is bad in at least two ways; no sensible animal – humans included – keeps returning to places or things which have caused it pain or fear. Evolutionary responses to threats with millions of years of development behind them kick in, and bad experiences with maths and science can put people off of having anything to do those subjects in future; the ‘flight’ part of the ‘fight or flight’ reaction. But if flight isn’t possible, and the scary topic proves unavoidable, a different threat response might take over, such as staying very still and hoping it all just goes away. I did my share of rabbit-in-the-headlights impersonations while staring fixedly at physics problem sheets in the mid-1980s, so I know the feeling very well. But whether the threat response is avoidance, shutdown or anger, it’s bad news for anyone who actually needs to learn stuff involving logic, because the part of the brain that deals with physical threats tends to take control at the expense of the part of the brain that does cool rational thought. This is where zombies come in really, really useful. Zombies are familiar. Zombies are predictable. Everyone can understand how zombies work: human gets bitten – human dies – human is reanimated as a zombie – new zombie shambles off in search of other humans to bite – and so it goes on. Nothing difficult about that. Some zombies are even funny. You can talk about zombies with your mates, and be reasonably certain that they know what you’re talking about, and that they’re laughing with you, rather than at you. All of these factors help to keep the freeze, fight or flight response at bay. OK, so there’s a equation on the page, and equations are bit scary, but this one is surrounded by the shuffling, groaning, flesh-eating undead, so it must be OK, right? Hold on a moment…. I just need to find out what that funny scratching noise is on the window.. …. ….. …………..
It’s good to see that modern zombie researchers* take Health and Safety seriously. You can never be too careful with hordes of the ravenous undead around. 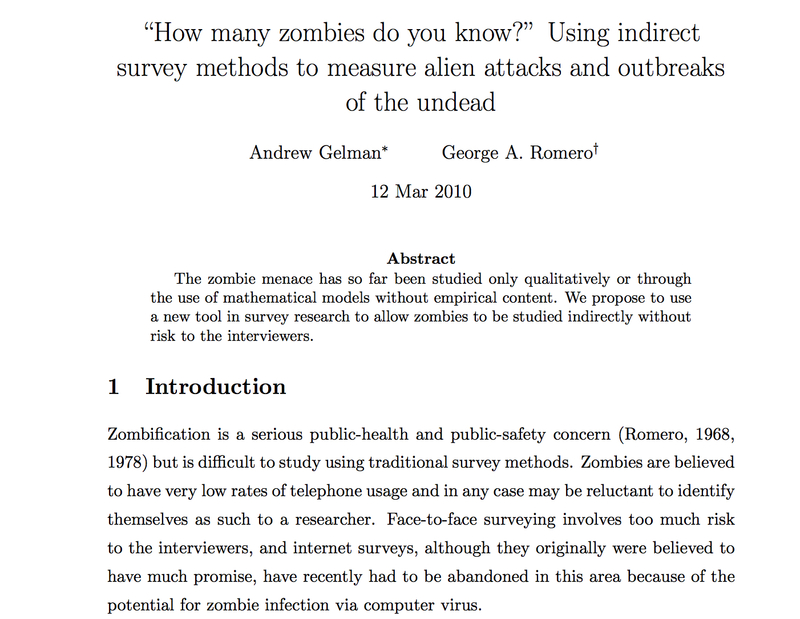 *As the author of the paper makes clear, that’s people who research about zombies, not zombies who do research. It’s an important distinction. Back in the dark, distant days before the World Wide Wibble, the sort of memes which nowadays pop up on Facebook walls and geeky websites still existed; they just had to find other ways of spreading themselves from one susceptible brain to another. The invention of the photocopier had much to answer for in this respect, and many a 1980s student flat or postgrad cubby-hole had grubby marks, cracks and mysterious stains on the walls covered by greying photostats of circulating humour. Failing to open a can of beans in the manner appropriate to one’s scientific stereotype was a common theme. Much of the rest was to do with beer, coffee and peculiar smells. For some reason all this nerdy silliness came back to me at the weekend when I was looking for a story summing up the dangers of excessive reliance on theory, and was immediately put in mind of the case of the spherical horse. That’s what a physics degree does to you I’m afraid. It’s lifelong and totally incurable. For those fortunate enough to have avoided this fate, I should probably explain that getting as far as graduation in this discipline tends to involve a lot of very complicated maths, much of which is applied to strangely simple theoretical examples. All perfectly fine in its natural habitat, but the approach sometimes needs a bit of tweaking if it’s to be useful anywhere else. Anyhow, back to that unfortunate equine… The story comes in many guises, involving various domestic birds and beasts from chickens to camels, but the version I remember involves a super-rich oil tycoon with a passion for horse-racing. His horses did well, but he wanted them to do better, and he figured that if physicists could work out how to split the atom, they ought to be clever enough to get his horses running that tiny bit faster as well. He advertised, and in due course a physicist arrived and set to work with computer and hideously complex formulae. Six months later, the tycoon was starting to wonder when he was going to start seeing results from his very considerable investment. (Even theoretical physicists need funding, don’t you know?) He summoned said physicist to his office. I’m currently less than two months away from finishing the final draft of my Ph.D thesis, which has very little at all to do with zombies. The perfect time, therefore, for doing a little light research on something which has almost nothing to do with my Ph.D – i.e. zombies. Not that I’ve needed do much in the way of active research; Halloween has just been and gone and the zombie meme has been working overtime, with undead representatives of every stripe crawling out of the woodwork all over the place. For instance, the Plants vs. Zombies advice zombie recently joined forces with the American Dental Association to remind children to brush their teeth in a ‘Stop Zombie Mouth‘ campaign. 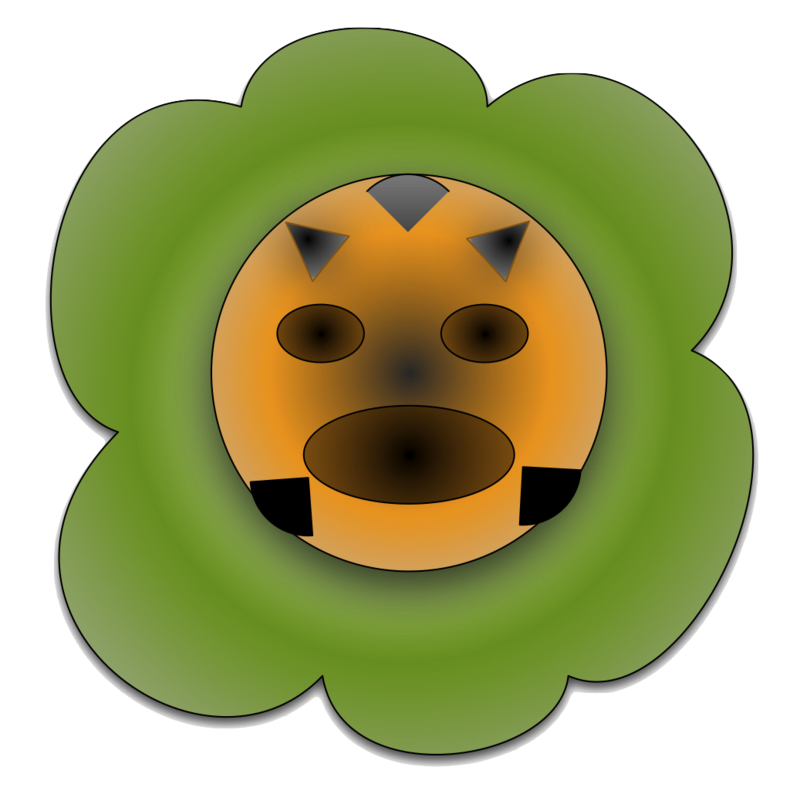 I love PvZ, but frankly, if I was being chased by a gang of brain-chomping ghouls I suspect that the presence or absence of spinach strands between my molars would be the last thing I’d be worrying about. Maybe I’m just odd that way – and I guess I’m not really their target demographic for this campaign either. For now I’ll stick to slinging Melonpults at Dr. Zomboss via my iPad. Meanwhile, in another bid to help those of us who aren’t undead yet to keep our bods in tip-top condition, the people at the sports tracking website Tribesports have helpfully set up a series of ‘Zombie Preparedness Challenges‘. After all, the First Rule of Zombieland is Cardio! You know, I can’t help getting a bit concerned about all these zombies being so concerned for our health. I think it’s just so our brains taste nice and fresh and well-oxygenated when they do finally catch up with us. On that basis, it’s good to see that online monitoring service IfTTT (If This Then That) now provide a ready-made ‘recipe’ for keeping tabs on any Zombie warnings that might come out of the Centers for Disease Control in the USA. That’s what I call useful technology – until they come up with a one-click recipe for Ph.D final drafts, at least!